The tick (Ixodidae) in dark field, edited and placed on white background. The tick was treated with alcohol and preserved in permanent mounting medium (Eukitt). Darkfield images were then taken under 40x magnification and stitched together with panorama software. The tick was cut out and placed on white background. Ticks are parasites that feed on blood. 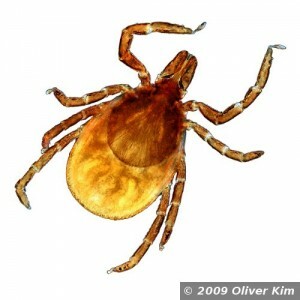 They are known to transmit a variety of diseases, such as Lyme disease (borreliosis) and tick-borne encephalitis. Zoom into the image here: Virtual microscope: The Tick.